On May 1st, 2008 @ 7pm DWR-Roslyn Studio will be celebrating the 50th Anniversary of Saarinen's Tulip Collection by showcasing the entire collection that Eero Saarinen designed to "clear up the slum of legs in the U.S. home". They'll also be kicking off the annual Knoll 10% Sale and Ann Skillman of Knoll will talk about the history of the company, including Eero Saarinen's relationship with the manufacturers of his designs. There will be examples of the new platinum finish Knoll has introduced to mark the anniversary for invitees to gaze upon. Plus, they're serving cheese and wine, so we'll be there and I will limit myself to one glass so I don't start singing this. 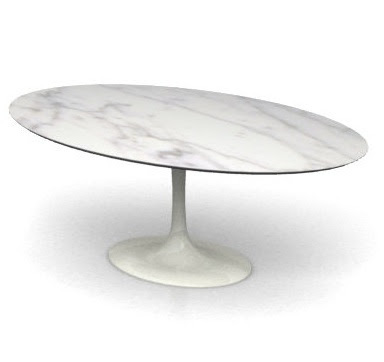 If I ever call in rich I've promised myself the 78" Tulip Oval Dining Table with a white (or maybe Platinum base) and an Extra White Marble top.